The Unity regime of Kabul continues to target the innocent people of Afghanistan and seek vendetta against them for the ongoing problems plaguing their rotten regime. Each day they bomb the homes of civilians, carry out night raids against them, loot their property, kill their women and children, imprison them and indiscriminately target them. The foreign occupiers and their regime allies continually target, bomb and raid the homes of Afghans. In such encounters the brunt of the damage is bore by ordinary Afghans. In the last few days alone we have witnessed dozens of Afghan civilians become victims to the foreigners’ night raids and indiscriminate bombardments or fall to the mass and aimless bombardment of the regime’s artillery. Last week alone in Paktika’s Khoshamand district – in the village of Minarah – 13 civilians of the same family were butchered as a result of American bombardment. The American planes targeted the house of Dr. Wrekhman and – including him – killed 13 members of his family. Locals told the Afghan Islamic Agency that all those killed in this bombardment were civilians. According to them those killed included women and children. The regime’s local officials in Paktika also confirmed that all killed in this incident were non-combatants. This is not the only tragedy that befell our ordinary civilians during this month. On the first of August regime forces killed Muhammad Shafiq in Maidan Wardak provincial capital. Shafiq was a teacher and had recently moved to the center from Chak district. 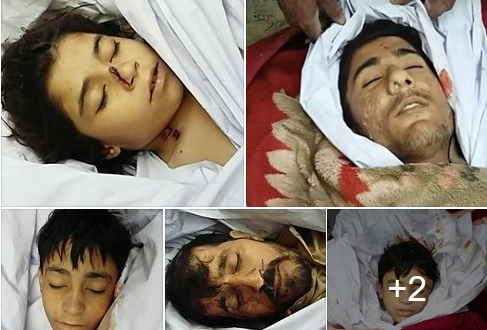 On the second of August the regime’s forces indiscriminately fired heavy rounds on villages in Kapisa’s Tagab district killing 2 women and injuring many more. Similarly on the fourth of August regime forces fired mortar rounds on villages in Nawa area of Zabul’s Mizana district. This reckless firing caused the death of one child and injuries to two more. On the 7th of August security forces in Badghis province’s Marghab district fired on villages located at 3 kilometers from their base. This unprovoked firing targeted civilian homes in Daikhoji village and took the lives of three civilians as well as causing grave bodily harm to six more. In addition, on the 8th of August troops from Ghormi military base, located Khost’s Speri district carried out raids on two villages (namely Bozi and Tanikhel) and after coming under fire, they deliberately fired towards ordinary villagers killing three and critically injuring six. The villagers were accused of failing to prevent the Taliban from using their village to attack security forces and some were taken prisoners as a deterrent. On August the 13th the regime forces again indiscriminately fired on the Dahman-e-koh village – located in Logar’s Muhammad Agha district. These mortar rounds struck the home of Sayed Jan – a local farmer – killing his child and wife. This practice of indiscriminately targeting civilian homes has become a common pattern in the regime’s military tactics over the past year and a half. The regime appears to target villages and villagers on purpose especially if they are under the control of the Taliban. The regime ostensibly calculated that by targeting and killing civilians they would compel these villagers to either stand up against the Taliban thus joining the regime or else suffer for their passive and neutral stance regarding the ongoing conflict. The villagers who unfortunately have suffered the most over the past 40 years are increasingly getting tired of the injustices perpetrated by the regime forces and compelled to join the fight against Kabul security forces. The Islamic Emirate strongly condemns such cowardly attacks against unarmed civilians and vows to avenge the suffering of these civilians. We call on the regime’s forces to confront us in battle rather than resorting to indiscriminate firing on civilian targets or the deliberate killing of villagers. This cowardly tactic will never deter the freedom fighters of our nation but would rather strengthen our resolve to cleanse our country from this treacherous and undisciplined mob that has personally being trained and funded by the enemies of Afghanistan.